Hey y'all, so I'm in a bit of a mess. Bus hasn't been moved in a year, and it's unexpectedly gotta get moved in about a month (Landlords have a property levy in effect for unpaid property taxes so I have to get out, yeehaw). I just got a quote from a tow company and its lot of dollars (they have to pull the drive shaft). Thought that might be easier than getting it driven. Seems like it's not. Unsure if it's in good shape to drive and not sure how to figure that out. Is it possible to have someone come out to look at it? Is that a thing people do? Could I pay someone a few dollars to kick the tires and reassure me? Do you know of any of those people in my area? What about hiring a driver, any ideas what that would cost? How do I find them? I don't have it insured at the moment but would consider going that route, especially if that would help with the tow cost (I did that before for an RV when it broke down). I also have a concern that we have a diesel leak and I don't know how to have that evaluated. Please talk me down from my panic. Also open to just selling the damn thing if this is much to deal with right now, just to put that out there. You can absolutely pay a mechanic to come and take a look at it.. And probably diagnosed the fuel leak. In my area that would cost a couple hundred dollars for the mechanic to do the diagnosis... I probably a few hundred dollars to repair the fuel leak. That's not taking into account any other issues that might arise. Depending on how you can ensure it it will likely cost you $100 a month or so I would guess. You have a month to move it... call the local bus barn or stop by and see if any of the mechanics do side work. Same with the local diesel shops. Thanks. These are workable steps. After a year your batteries will likely be toast but first try to charge them overnight and see if the beast will start. Assuming it was running good when parked there's a good chance it will start now. If you're not moving it very far I wouldn't bother insuring it, just cross your fingers and go. One of our previous members did a cross country move with no plates or insurance and didn't have a problem. If it's got plates I wouldn't think twice. The diesel leak may be a problem depending on how fast it leaks and where. 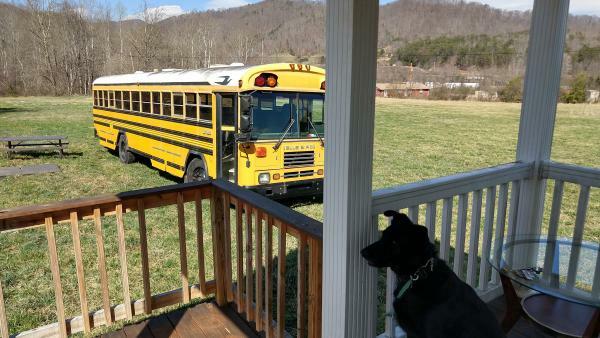 Where in Asheville is the bus and what bus is it (Make, Model, Size, Engine)? Also picture would be helpful. I may be able to help you this week to get the bus to a new location unless it is a total wreck. I am currently in Weaverville but plan to drive North in a week or so. HEY THERE! '95 bluebird tc2000, automatic. 30ish ft. Currently working on getting batteries charged and unfucking the wiring (pulled the safety switches and haven't closed all of the interlock circuits yet, have a friend coming to help with that). It's not a total wreck, but I don't know how to evaluate it. Just kicking the tires & strategizing with me would be really helpful. New spot isn't available until June 1. Location? If close enough, I could meet you this week or WE. I will be back in Asheville before June. Thank you! Candler. Kind of the opposite side of Asheville from you. If your bus starts and actually moves, but you don't feel confident in driving it any major distance, get a AAA membership with RV coverage (I think it's like $175 a year or something like that) and make sure it's in effect before you drive the bus (I think there's a waiting period for it to kick in which might make this useless to you). Then go wherever you're going and know you can get a tow if you need it. If you even just make it out to the street before it quits, you're good to go.